1 - Duvet Cover - 88 x 88"
2 - Pillow Shams- 20 x 30"
Change the look of your bedroom in a snap with a reversible Zanzi duvet cover set by LJ Home Fashions. An eclectic vintage inspired 'wine glass' print reverses to a chevron (geometric) print design. Cotton blend. Duvet cover has a zipper closure. Shams have an envelope closure. Available in double, queen and king sizes. Cold water wash with like colors. Tumble dry on low. 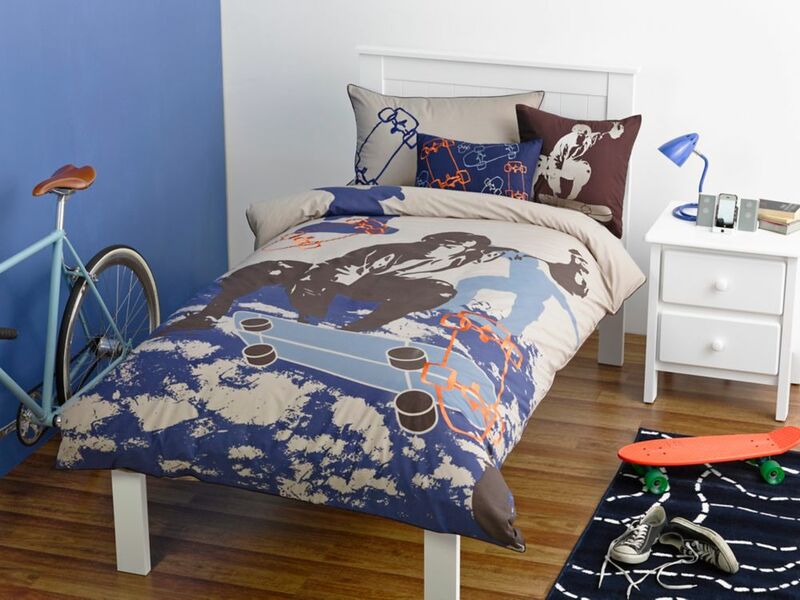 Skater Duvet Cover Set, Full/Queen Contemporary Childrens Bedding - Beautifully designed bedding that makes little imaginations soar. Finely crafted from 100% cotton fabric for durability and ease of care. Skillfully finished using complementary prints and patterns, elaborate embroidery, and unique appliquis.